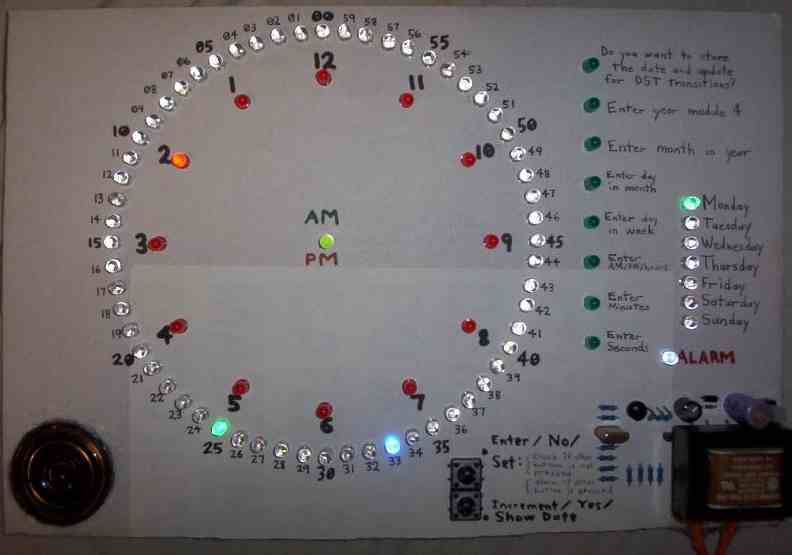 Here we have a circular LED clock kit. This time, it comes with a board. It is the same type of clock which is shown here, it's just that this time it comes with an actual board! What a time-saver! The green board you see there is a square which is 3.9 inches on a side. Click on the picture to see it big, and use the left and right arrow keys to move around. 2. You are buying a kit. You get 91 LEDs (one spare), a programmed microcontroller, resistors, capacitors, a crystal, a speaker, etcetera, a circuit board, and an information sheet on specifics you'll need to get it right. This does NOT include a power supply. You need to give it 6.3 to 12 volts DC from somewhere. You also need a soldering iron and solder. 3. The kit does not contain ultra-bright brightly colored LEDs as seen in the picture. You get generic red and green LEDs. Just like the 8 pink tinted LEDs you see in a row at the bottom of the clock. Those LEDs by the way indicate which parameter you are setting. So you have 7 LEDs for the days of the week, 60 for the ring of seconds/minutes, 12 for the hours, 1 each for AM and PM (tell me if you only want one for AM or one for PM rather than a LED for each of them - you must decide beforehand whether that LED will be there), 1 to let you know if the alarm is set to go off (but isn't necessarily going off right now), and 8 to let you know what you are setting, when you are setting it. Those pink and green tinted LEDs that come standard with this kit are also sold on their own on the website here. By the way, there are 2 completely different versions of the program, one which controls a "AM" LED which is on in the morning and a "PM" LED which is on in the evening, and a different version which controls only the PM LED, which is off in the morning. If you only want one LED to denote AM/PM, you can't use the version that controls them both, because it will turn on other LEDs when it tries to turn on the AM LED which won't be there. Please tell me which version you want or I will choose for you. THIS particular version of the board can in fact handle either surface mount chips or DIP chips. I have surface mount PIC16C54 chips and DIP ones and I may give you one or the other. Almost certainly it's going to be surface mount, unlike the one in the picture. But it's the big kind of surface mount. 1/20 inch between pins. In the picture, you can see I actually have a decoupling capacitor soldered to it. You should have a decoupling capacitor between the 4th and 5th pins down on the left side on ONE of the pads. On retrospect, it is not so aesthetic, where I put it. I should have put it on the backside. The DIP soldering pad goes from the top side to the back side, and the SOIC one only exists on the front side, but the pinout is the same. If you have a preference for a DIP chip or a SOIC chip since either can be used, but with that option, you are more at my mercy, whether availability allows. Probably it will be SOIC but if I have any made up with DIP and you want them, I'll let you have it. It is not only a clock but a calendar too. You give it the year modulo 4, the month, the day in month, the day in week, hour, minute, second. Press one of the 2 buttons to get it to show you the date (the 5th picture shows this - it displays the date March 1 - today as of when I wrote this), where the 12 hours represent the month and the minutes/seconds represents the day in the month. The ring of 60 LEDs shows you the minutes AND the seconds. The seconds flash. Also they advance one per second. It also automatically adjusts for daylight saving time as it is right now in the US. So beware if you're in a place that doesn't do daylight/standard transitions or does it at a different time. The alarm can be set to any time down to the second, and can be enabled for any combination of days of the week. So if you want it to just go off on weekdays you can do that. Or if you want it to only be on Saturday, you can do that. The alarm is set by holding down the "show date" button and then pressing the set button. If you just press the set button, it sets the clock's real time, not the alarm time.